Black and White is In and with Sammy Dress You'll Win! The perfect way to transition from winter into spring is by wearing lightweight tops and blouses in the seasons hottest trends and colors. 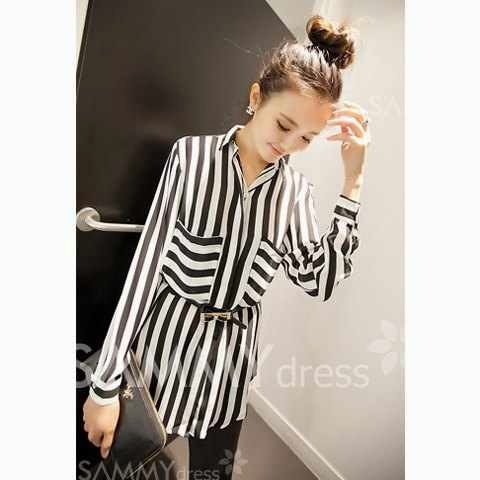 Check out this Sammydress.com blouse, doesn't it look nice? It is wide black and white vertical stripes, with small pearlized buttons and a lady-like scoop hemline. You can belt this top or wear it, as styled in these pictures, paired with bright color leggings or black ones. It is a perfect style to wear, anywhere for example, to work or an outing. This awesome top is priced at the very reasonable cost of $11.48. Follow this link to order and get more information on this item. Notable Styles Tip of the Day!! A Wedge Appetizer, No Lettuce! Jay Z and Beyonce: On The Run Tour!! Mod Puppy Print and Denim Skirt Trick!! Notable Tip of the Day!! H and M Conscious Collection Spring 2014! Notable Styles Looks of the Day! !